Items per quantity: Pack of 25 labels. Caution heavy end, arrow left label. Lifting point symbol safety sign. Stack correctly symbol and text safety sign. Use handling aids symbol and text safety sign. Lifting point symbol label. Waterproof, chemical (solvents and oil) and abrasion resistant labels. Available in three sizes. Supplied in packs of 25 labels. Laminated safety labels. 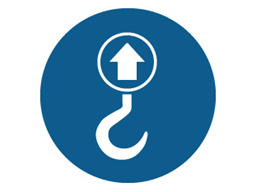 Lifting point safety symbol. Rub test compliant. Abrasion resistant, chemical resistant and waterproof. Symbols comply with ISO EN 7010 and Safety signs and signals regulations 1996. Supplied in packs of 25 labels. MAN107 Size 50mm diameter. Material self adhesive vinyl, with clear protective laminate. MAN207 Size 75mm diameter. Material self adhesive vinyl, with clear protective laminate. MAN307 Size 100mm diameter. Material self adhesive vinyl, with clear protective laminate.